OXFORD, Miss. — It’s not even halfway through the football season and No. 14 Mississippi already is a beat-up team. Starting linebacker C.J. Johnson was the latest to join several Rebels on the sideline, including safety Tony Conner and defensive tackle Issac Gross. Johnson had surgery on his left knee to repair a torn meniscus and is expected to be out four to six weeks. Couple the injury news with the reality that the Rebels were embarrassed last week in a 38-10 loss to Florida and the mood has been a little apprehensive in Oxford. Coach Hugh Freeze said now is not the time to lose faith. "We need to circle the wagons, own what we did, own what we didn’t do, and we still have a lot to play for and a long season left," Freeze said. "We can’t operate like the rest of the world and put our hands in the air. We have to get back to work." Considering all the bad news, it’s probably a good thing that the Rebels’ schedule is a little lighter this week. Ole Miss (4-1) is a 43-point on Saturday when it hosts New Mexico State (0-4). Ole Miss will likely rest several of starters, including multiple offensive linemen. That should give young players the opportunity for ample playing time as the Rebels try to build depth for a difficult stretch run that includes games against Texas A&M, LSU and rival Mississippi State. "I believe that this team will respond, no question," Freeze said. "We have the ability to be one of the best teams in the country." HURTING REBELS: Ole Miss has had to deal with numerous injuries over the first half of the season. The latest: Linebacker C.J. Johnson had knee surgery on Monday for a torn meniscus and is expected to miss the next four to six weeks. Other key defensive players out with injuries include safety Tony Conner, who also has a torn meniscus and is expected to miss at least a few more weeks, and Issac Gross, who is out for the season with a neck injury. REBOOT THE OFFENSE: The Ole Miss offense looked like arguably the best in the country through the first month of the season, topping 70 points two times and dumping 43 points on Alabama. But the Rebels looked very ordinary in a 38-10 loss to Florida last weekend. Four turnovers certainly didn’t help and the Ole Miss will be trying to clean up the mistakes and regain its form from September. TUNSIL WATCH: Ole Miss starting left tackle Laremy Tunsil is expected to miss his sixth straight game on Saturday because of a continuing NCAA investigation. Rebels’ coach Hugh Freeze said he hopes for some news on Tunsil’s possible return in the near future. Ole Miss is struggling with its depth on the offensive line and could use Tunsil’s imposing presence on the left side. BREAK IN THE SCHEDULE: Ole Miss is hoping to take control of the matchup early against winless New Mexico State before a difficult four-game stretch that includes a non-conference game against much-improved Memphis and then three league games against Texas A&M, Auburn and Arkansas. The Rebels then have their bye week before finishing the season with LSU and Mississippi State. 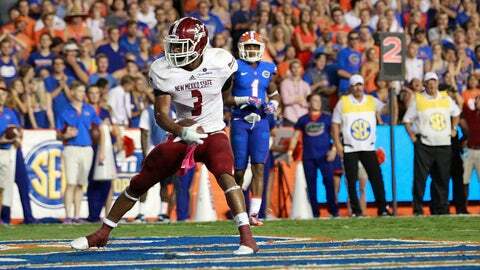 TRUST IN ROSE: New Mexico State is a huge underdog in Saturday’s game, but the Aggies do have one star player in Larry Rose III, who has run for 579 yards, six touchdowns and is averaging 8.2 yards per carry.